In the grazing industries, knowing your cost of production ($ per kg of meat or wool) is one of the most important pieces of financial information you can use to assess your business performance. Comparing your performance against other businesses (procedure 1.3 of this module) is more meaningful if you know your costs per kg. Making sense of prices and marketing (see procedure 2.3 in Market Focused Wool Production, and procedure 3.1 in Market Focused Lamb and Sheepmeat Production) is also much easier. Simply comparing your cost of production with your average sale price will give you a quick check of your business health, and show the likelihood of the difference between the two being sufficient to meet your overhead costs, interest expenses and taxation liabilities. Because calculating cost of production is such an important step in analysing business performance, a specific set of tools is included with this module to make the job as easy as possible. Tool 1.7 – the AWI-developed cost of production calculator for wool enterprises can help you work out your wool production costs to help determine the right time and price to market your wool. 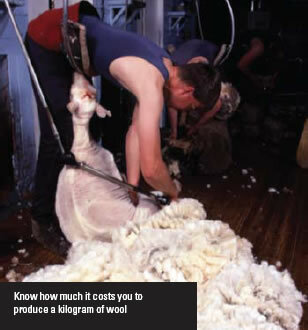 It is critical to know what it costs to produce a kilo of wool so you can decide when and how to sell your clip. Tool 1.8 – the MLA-developed cost of production calculator for beef enterprises (included in this module because it will allow sheep producers who also run some cattle to see how that enterprise is going). Note – printed copies of the MLA and AWI calculators are included in the tools section but they are more suited to electronic use. 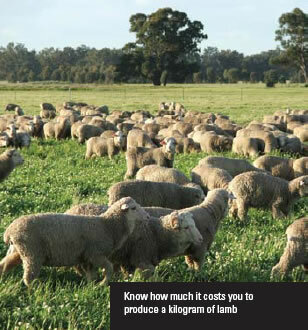 MLA Lamb Cost of Production Calculator: www.mla.com.au – click on “Tools & Calculators” under the "Extension, Training and Tools" tab on the home page.